All the motivational books and online talks can’t substitute for that face to face buzz of engagement with positive people and places. Get out from your office, no matter how big and luxurious, out from behind your desk, your artist’s studio or wherever you’ve claimed as your own and into the world outside. Why would you want to have a meeting in an office when you can be out doing the ‘walk and talk’? 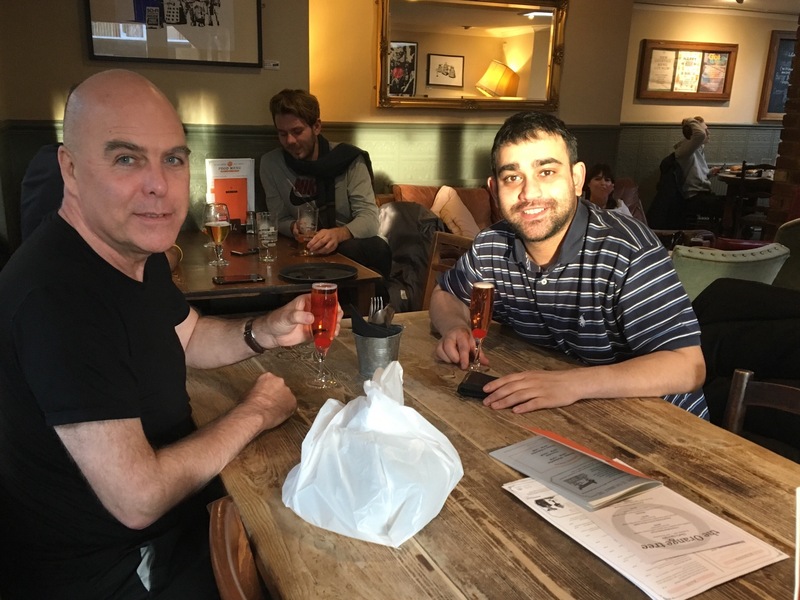 Here I’m in relaxed but thinking mode with the razor sharp good doctor Beejay Bhatt in Loughbohemia’s (some call it Loughborough) Orange Tree pub after a brisk walk through the town’s traditional street market. Now me and Beejay don’t agree on everything but we engage, positively engage, and engagement is the spark to light up new ideas, new pathways! Try to make sure that engagement, real not superficial, is at the heart of your practice be that business, art, writing, homebuilding, caring and you’ll reap the benefits!